Linfield are exploring proposals which would enable Windsor Park to be turned into a 22,000 capacity ground capable of retaining international football. A big question mark has been placed over Windsor Park's future suitability for internationals because of health and safety issues. 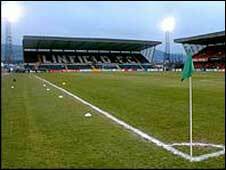 However, Linfield say that they have already drawn up plans for a redevelopment of the stadium. The club acknowledges that the plan would require major government funding. Doubts over the mooted Maze Stadium project means that the Irish FA has been left with major concerns over where Northern Ireland home games will be played in the future. The IFA had been attempting to terminate its long-term deal with Linfield which states that senior home internationals must be played at Windsor Park. However, that was before the Maze project appeared to hit troubled waters. "Our architects have drawn up plans and we believe it is a project that should be seriously considered," Linfield chairman Jim Kerr told Ireland's Saturday Night. Linfield's project envisages the building of new Railway and South Stands plus a new roof on the North Stand at the south Belfast stadium.